The exhibition will be part of a Global Fashion Launch in December 2016 and will remain online and be viewable through the Google Cultural Institute indefinitely! If you haven't explored the databases yet, check it out through the link below - gobs of exhibitions from world-class organizations at your fingertips! Back to New England I Go . . . I was recently offered a short term residency spot at Vermont Studio Center in October, which I accepted. I grew up in New England, though sadly it has been quite some time since I visited. Totally excited to be heading back (peak season too!) for some much-needed focus time. I currently have 3 pieces on view at the University of Kansas Art & Design Gallery for Something Fleeting. Curated by Kyla Strid, Something Fleeting is a collection of current work created by select Lawrence Arts Center Faculty exploring the transitory through material, concept, and process. The show will be up through October 13th. It was little under a year ago that I applied to a call out from the Society of North American Goldsmiths for an intern. Almost one year later, I am absolutely grateful I did, and thrilled to be continuing work for the organization in different capacities. The Asheville conference was beautiful and I garnered some amazing friends and connections. Through SNAG I found a totally supportive network, filled with opportunities and amazing creative personalities, all united with a common vision. It is truly is a resource worth more than gold. SNAG featured my work in last week's newsletter (the "Foundation Necklace") in a little feature about the "30 Under 30" award. Thanks guys! It's late, as I was holding out for a video of the talk, but until then, here's an image of me presenting my final PechaKucha presentation for ArtistINC last spring at the Lawrence Arts Center. Much to my surprise, I opened my email to find out that I had been named one of American Craft Week's "30 Exceptional Craftspeople Under the Age of 30," and will be featured in the October 2016 issue of Modern Handmade (formerly known as The Crafts Report). My work, along with work by all the other winners - and I'm in good company - can be seen in the digital exhibition Rising Stars here. Quite humbled. It's in the middle of a blistering Summer here in LFK, so a good dose of mountain air was sorely needed. Last spring I was awarded a full fellowship to attend a workshop at Anderson Ranch this month - "Cast Away", with the awesome Norwood Viviano. Norwood had offered a similar class last summer, and while I desperately wanted to go, had missed the deadline for any sort of funding. Not this time around. This technique-heavy course consisted of scanning and creating forms in Rhino 5, printing them, and then creating multi-part sand mold to cast the pieces in aluminum. I enjoyed the intermingling of ancient and contemporary technologies, and especially took advantage of integrating my own body, via scanning, as a platform to build off of. Anderson Ranch is a magical place - a summer camp filled with artists with beautiful studios and food so good no one will believe you when you get home. I picked a great week to attend, as I got to see Arno Rafael Minikkeen (eeee! ), Tom Sachs, and Jerry Saltz speak. Not to get all gushy, but my the end I had enhanced my skillset exponentially and made some great connections, as well as friends I will never forget. Can't complain about a little extra free press, yes? It's been a whirlwind the past couple months while I juggle applications, ArtistINC, an internship with SNAG, all the regular consignment/custom/repair orders, on top of continuing to experiment with new materials and ideas, and I've barely had a moment to contemplate it all. A rolling stone gathers no moss, and it can easily break doors down if rolling fast enough. This article recently run by The Lawrence Journal World highlighted both my (and 3 of my wonderful coworkers - ladies represent!) achievements of the past couple months. The Lawrence Arts Center is an extraordinary place which fosters new growth not just in its students, but in its employees as well and I'm so thankful for how supportive they have been to me the past two years! One of my favorite textures to date. I have work currently on view through February 15th at EatMetal, INC in Hoboken for their Arm Candy exhibition! Wishing I could travel out to NJ to see the space. Check EatMetal, INC out here. Photo Credit: Elizabeth Tokoly, Director and Curator of EatMetal, INC. Playing with electroforming. 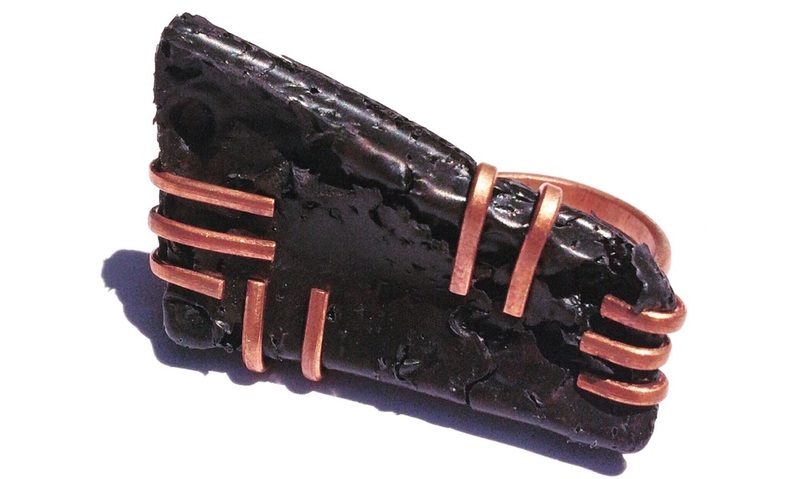 Copper, 2015. Behind every good jeweler is an excellent photographer. Big thanks to Stephan Anderson-Story, who has been handling a lot of my documentation lately. I cannot rep his talent and professionalism enough. 3 programs, 2 field recordings, 1 damp basement. We took advantage of those long summer days. It's still under construction, but is coming together nicely. Keep a look out for more products soon! Dropped off a commissioned peice to its new owner today - double men's ring, copper and latex. Latex is my new favorite material to work with - its flexibility allows me to experiment with designs easily. A bunch of sawed copper halberd pendants on stainless steel cable chains. Around Spring Break I had the pleasure of visiting the St. Louis Art Museum - their armory collection contained many pole weapons with interesting head shapes. I sketched as much as I could. Soon, I will be opening a shop, either through the SS service or Big Cartel, where these will be available. Last Thursday was the opening of Ghost Gallery's "Bell Jar: A Group Exhibition", and I have several pieces in the show. If you live in the Seattle area I urge you to go check it out! This exhibition is a continuation of Ghost's series of shows featuring only artists identifying as female, which includes all exhibitions from March to October 2015 . I'm very pleased to be a part of this - I adore Ghost Gallery and will always visit when I'm in Seattle. Founded in 2006 by the very talented and savvy Laurie Kearney, GG is a retail and gallery space in a tucked away little corner of Capitol Hill. GG has featured many artists and jewelers I admire (Wolf and Sadie, Open the Cellar Door, Caitlin McCormick, The Small Beast) and I'm honored to be showing there with so many other fantastic female artists from around the world. Sadly, having just gotten back from a trip to Seattle, I was not able to fly back out again so soon. Luckily, Ghost Gallery features all work online. You can see works from past and present exhibitions, as well as browse the shop. Here are some shots of the three "contained ecosystems" I have on display, and you can see more pictures of these on my instagram, and shots of the show on Ghost Gallery's. It's been a while since I've done a FF. This weekend, a selection of my small textured paintings - dubbed Textura - will be hanging in a gallery space in North Lawrence (right next to Tooter & Tillaye's) along with sculpture and paintings by Kris Kuksi. Here are some quick snapshots during a quiet moment. I like to think of these as studies - little tests for some possible bigger work. The many layers of chemical media and natural material got me thinking about eventual ephemeral breakdown of the paintings. Bigger and safer may be in order. Hope to have a small batch of these Zufall (Chance) Rings done by the end of the month. Kicking myself for not posting about it sooner, but I had a great time selling prints, originals, patches, and jewelery (along with Myles Dunigan [wall] and Paige Hinshaw of Statuary Designs) at Vacant Farm's Holiday Art & Craft Sale this weekend. Thanks to all who came! Vacant Farm is KC community art space facilitating and supporting all manner of artistic creation, education, and exhibition, located in an industrial patch in Westport. I felt very welcomed by all the artists involved, and hope to see them again! More of these after the Yule season is complete.